The Death Flower is a flower that grows on a bush. The flower can stave off Death and garner your sim some Simoleans in the course of fulfilling an opportunity. The plant itself will bloom with one flower. Once your sim harvests the flower, the plant will die. 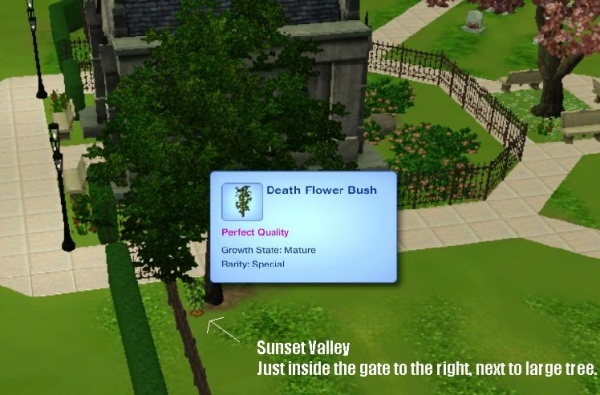 Sims with the Green Thumb Trait may be able to revive the dead plant to get a second flower to bloom - after that, it will go permanently barren. Keep this flower in your sim's inventory - if your sim unexpectedly dies, the sim will automatically offer this flower to the Grim Reaper, who will resurrect you in exchange for it. There are Unknown Special Seeds that requires level 7 Gardening to plant. You can find them near the graveyard and use them to grow another Death Flower Bush. It is also possible to catch the Death Flower while fishing. If a ghosts possesses the Death Flower Bush when it is ready to harvest, it will be reset to the mature state when the possession is over. There is an opportunity associated with the Death Flower that requires your sim to bring a Death Flower to a specified sim in exchange for a reward. This page was last modified on 9 October 2012, at 16:56. This page has been accessed 68,322 times.